Adam Braun began working summers at hedge funds when he was just 16 years old, sprinting down the path to a successful Wall Street career. But while traveling as a college student, he met a young boy begging on the streets of India. 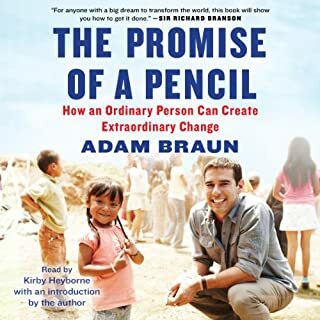 When Braun asked the boy what he wanted most in the world, he simply answered, "A pencil." This small request became the inspiration for Pencils of Promise, the organization Braun would leave a prestigious job at Bain & Company to start with just $25 at the age of 24. 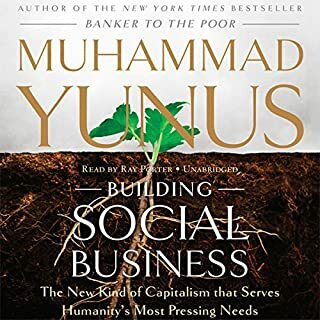 Muhammad Yunus, the practical visionary who pioneered microcredit and won the 2006 Nobel Peace Prize for his world-changing efforts, here develops his revolutionary new concept that promises to redeem the failed promise of free enterprise: social business. When Daniel Lubetzky started KIND Healthy Snacks in 2004, he aimed to defy the conventional wisdom that snack bars could never be both tasty and healthy, convenient and wholesome. A decade later the transformative power of the company's "AND" philosophy has resulted in an astonishing record of achievement. KIND has become the fastest-growing purveyor of healthy snacks in the country. Join a Growing Movement: Learn how you can join a global movement to redefine success in business, led by well-known icons like Patagonia and Ben & Jerry's, disruptive upstarts like Warby Parker and Etsy, and recently covered by The New York Times, The Economist, The Wall Street Journal, Inc., and Entrepreneur. 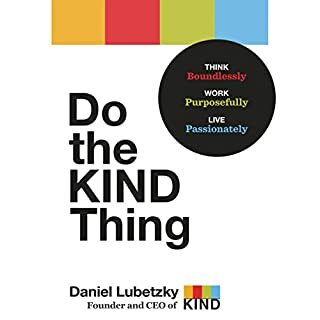 An interesting book about using business for good! What matters most to you? Should you focus on earning a living, pursuing your passions, or devoting yourself to the causes that inspire you? The surprising truth is that you don’t have to choose—and that you’ll find more success if you don’t. That’s the breakthrough message of the TOMS One for One movement. You don’t have to be rich to give back, and you don’t have to retire to spend every day doing what you love. You can find profit, passion, and meaning all at once—right now. 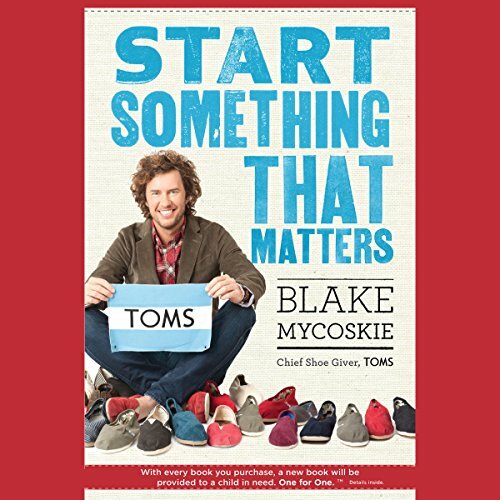 In Start Something That Matters, Blake Mycoskie tells the story of TOMS, one of the fastest-growing shoe companies in the world, and combines it with lessons learned from other innovative organizations such as Method Products, charity: water, FEED Projects, and TerraCycle. Blake presents the six simple keys for creating or transforming your own life and business, from discovering your core story to being resourceful without resources; from overcoming fear and doubt to incorporating giving into every aspect of your life. No matter what kind of change you’re considering, Start Something That Matters gives you the stories, ideas, and practical tips that can help you get started. You’re inspired by charity: water, method, and FEED Projects, and want to learn how these organizations got their start. Blake actually reads his own book, and than is really very cool. He is so down to earth, you can't help but love him. His message is really worth listening to, and I think he accomplishes his objective. He tells you what it is at the end of his story. He's got me thinking in new directions, I never even thought about before. The story itself, is actually amazing, and all along it he gives you advice. I really think you should give it a try. Thanks Blake! I almost didn't buy this. I'm happy I did. Would you listen to Start Something That Matters again? Why? I almost didn't buy this audio-book. The little sample I heard didn't wow me, but the idea behind the book did. I'm so happy I bought it. I loved the story behind his company and the inspiring stores about the other companies he mentions. It will make you think about your business and your life. I have to see if he sells 10.5 EEE shoes. I have recommended this books to many friends, already I just love the story but also the fact that it gives you resoiurces to use to follow your own passion to be able to "Start something that Matters"
His Story on how he got started and then how his ideas began to grow. Which character – as performed by Blake Mycoskie – was your favorite? I've listened to it twice now and have gone out a baught a copy to tab and highlight for future references. I would encourage everyone with a passion about anything to go and read this one. Where does Start Something That Matters rank among all the audiobooks you’ve listened to so far? I got through it pretty quick because it kept my interest. I put it on 2x speed and that was a perfect tempo. What does Blake Mycoskie bring to the story that you wouldn’t experience if you just read the book? He made it personal and that made all the difference. He came across as real and unpretentious. He makes the listener feel that they can do it too, his ego is in check. What did you learn from Start Something That Matters that you would use in your daily life? You must be okay with failing a bunch of times and keep going. I don't know how political he really is, but, I like how he didn't make his book political. All realms of politics seem to be congested with people that are holier than thou. I have a feeling he's more interested in looking for good in people and he finds it much more often than most. 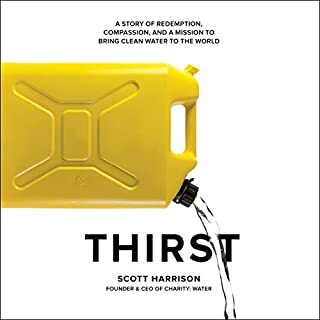 Yes, this book is a true testimony to be shared with anyone, particular with friends on their journey to inspire and make a difference in the lives of others. What was one of the most memorable moments of Start Something That Matters? When Blake reiterates that every venture he undertakes should be a difference in the lives of others and not just the financial gain that he receives. Additionally, using the customer to help make a difference, their involvement is not merely a consumer only but also an advocate of the business. I was able to identify with his leadership style when he describes how to create an organisation that is built on trust and mistakes by employees should be forgiven. I agree there should be zero tolerance for dishonest and untrustworthy employees. Blake's academic referencing adds to the quality of the book. Have you listened to any of Blake Mycoskie’s other performances before? How does this one compare? This is my first time reading Blake's material. To start off with a small idea that matters and grow it into something big. Also avoiding unnecessary overheads and use the resources that are readily available to grow the business. Having left my job a few weeks ago I needed to hear Blake's professional and personal experiences, suggestions and inspiring message. This book has awaken the burning desire within me to succeed as an upcoming entrepeneur. This is inspiring material I will forever reference. Great story of purpose and inspiration! If you could sum up Start Something That Matters in three words, what would they be? The narration is the one thing I had trouble with...his tone and reading style I did find annoying, I'm sad to say. I still listened to this audio twice because I was so encouraged by the stories and content but had to push myself passed the narration style. I appreciate that the author wanted to perform the reading but his choppiness and very predictable inflections at the end of every sentence made the audio part...sorry I have to say it...annoying. I completely love the finding a deeper purpose stories of not only TOMS but many other stories included. It made me very envious of all the people that found their own purpose and greater purpose because it helped others. Very likely I will listen to this audio a 3rd time and hope inspiration hits me square in the face. 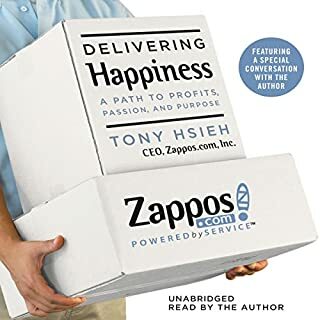 The story of Tom's is inspiring and an interesting read, the author ads some book wisdom from other self help books to fill up the gaps and ads some letters and stories of people who also used the one for one idea to start a venture. A must real book!!! It has inspired me to "start something that mathers "
What did you love best about Start Something That Matters? That Blake read it himself. It added the element of authenticity to the story and allowed me to feel like I was listening to his real story and not a version of it from someone else. The story of the early days of Toms, and how much they accomplished with creativity, luck, a sense of purpose, and a sense of humor. What about Blake Mycoskie’s performance did you like? His voice was easy to listen to, and he was totally geniune. He provided some interesting view points on what to consider when thinking about taking a leap and building something of your own, about following your heart with practical and realistic tips. Redefining what corporate America could be. The marriage of making money and doing good for the world. Would you consider the audio edition of Start Something That Matters to be better than the print version? I enjoyed listening to Blake Mycoskie detail his story and how he came about TOMS. Its a story of how Blake formed the company TOMS, it's also about giving back. Sure there are companies out there who do this, yet are they as passionate at Blake? It's a good read and one that will give one food for thought. Loved this! The story is very inspiring and super easy to listen to. Start something that matters will definitely help many individuals find their calling. This book is amazing, I love the whole Toms story, really will inspire you to do more to help other. I can read this book over and over again. Thank you Blake for inspiring me. Inspiring entrepreneur story that makes me belief in the act of helping others and making a difference in society. Particularly helpful for those still thinking of how to start. Makes me want to meet Blake. 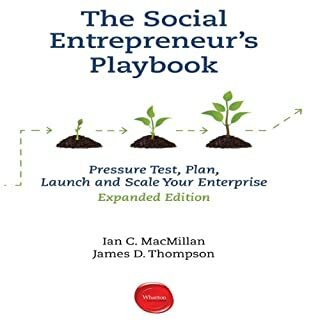 For a social shoe entrepreneur like me, this a must read that lives up to all expectations. Time to buy some Toms. I am a true TOMS fan after listening to this audiobook. Great insights to starting a business that matters and very well narrated. I love the way this book was written and narrated. I felt like I was right beside Blake the whole time as he was trying to set up TOMS and then keep the company alive. I felt heartbreak whenever the company hit an obstacle. That's how invested I felt in the story. One of the most inspiring stories I've come across so far.